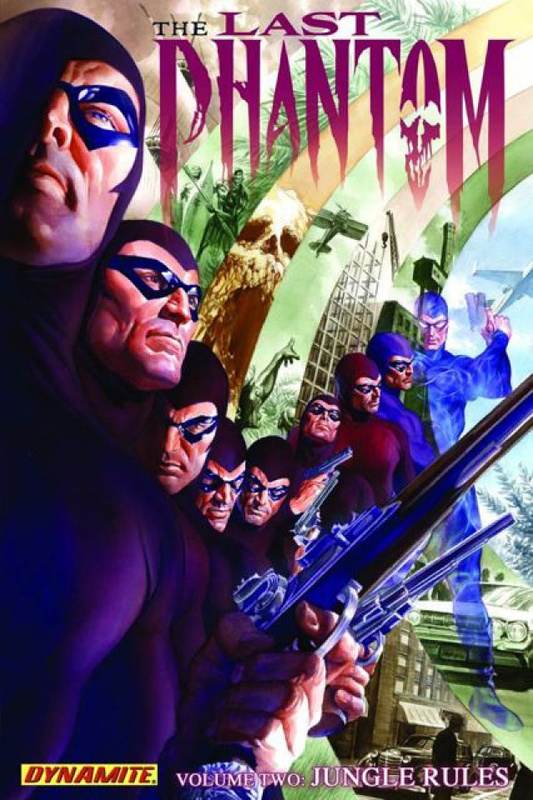 After the climactic confrontation with friend-turned-foe Peter Quisling high above the streets of Midtown Manhattan, The Phantom finds himself on the run and quite literally a man without a country. JUNGLE RULES' picks up just moments after Kit Walker's dynamic leap of faith at the conclusion of THE LAST PHANTOM: GHOSTWALK, as Kit decides to leave behind the charitable Walkabout Foundation headquartered in order to return to war-torn Bengali, home to the previous twenty Phantoms that came before him. But the road back is, of course, fraught with danger at every turn… even for a Man Who Cannot Die. Bengali's blood-soaked military junta may be the least of Kit's problems when he is forced to face the secret history of the Phantoms and the resurrected ghost of his own father! Issues 7-12 of Dynamite's THE LAST PHANTOM and THE LAST PHANTOM ANNUAL #1, all featuring Lee Falk's classic comics hero by Scott Beatty (Buck Rogers, Merciless: The Rise of Ming) and Eduardo Ferigato.